Written by admin on February 26, 2013. My first Bus was a ’63, which I converted to a hard-top camper and I traveled with a high school buddy in 1971-72, working our way through 44 states in 9 months ~ only one serious breakdown, rod through cylinder #3. What a time! Next was a bright red ’71 Transporter purchased used in northern Maine. It rusted out in a couple of years. 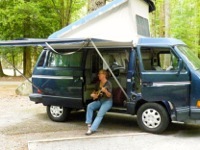 On to the ’74 Hardtop Camper, and the beginning of my music touring career around 1980 ~ it was a dependable workhorse, I adjusted the valves often ~ exactly how it was described in the Idiot Book. Started making a bit of money with the concerts and bought an ’87 Westfalia, which was good til the transmission failed and after being towed to the dealership where I lived in Asheville, couldn’t resist the brand new white 1991 Westfalia, my first new VW! I traveled extensively with my music for the next 9 years, across 22 states, over 365,000 miles on two engines and two transmissions, and thousands of concerts. 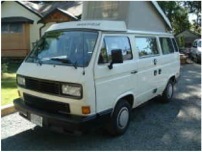 In year 2000, I found my current ‘91 Westy, already 9 years old but with only 55,000 miles! 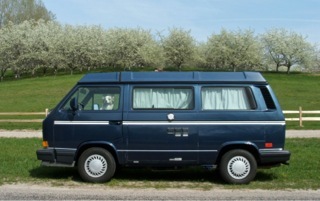 So lot’s more touring, many more adventures and now this one has 311,000 miles. But something changed in 2008 when I researched the alternatives for an engine conversion and decided to go with the guys at Bostig for the Zetec. Since then my life as a VW owner has eased into the most enjoyable experience of them all. Thank you, Bostig! I purchased the turnkey solution from them, and they sent the kit and the engine to my mechanic in Asheville, NC. My mechanic, Chris Stivers (Asheville Vee Dub, great guy) was game for the new experience and had the job all done in about 2 – 3 days. Since then, there have been less than a handful of issues to deal with. Replaced a cooling hose once. When my accelerator cable broke in the middle of nowhere, Florida, I called the guys in Boston. Under the car, phone in hand, they walked me through a temporary repair, using a hammered dulcimer string, sent me a new cable overnight and walked me through the installation ~ perfect ever since. Now that is service! 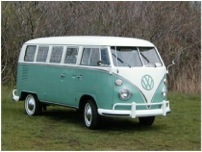 Here we are in 2013, and we’ve retired the Westy from performance touring. Now we tour in a 2010 Jetta Sportwagen TDI (Diesel), which gets seriously 44-48 (we’ve seen 50) miles per gallon. Our ’91 Westy, with the beautifully designed and incredibly reliable Ford Zetec engine conversion (now with around 80,000 miles) is my town car, and our ticket to adventure here in the western North Carolina mountains. We love pulling up to one of the waterfalls on the old forest service road headed to Douglas Falls, popping the top, cooking something delicious, sitting back with one of Asheville’s famous craft beers ~ and playing tunes and singing songs into the night. So, 50 years later, no more cramped hammocks. I can just slip into the comfortable bed with my sweetie and fall asleep to the sound of a cascading waterfall, knowing that when I get up, the car will start right up and take us home without a hitch. 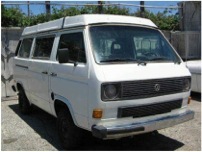 Thank you VW for all those years in such a fun and versatile vehicle, thank you Bostig, finally, for the peace of mind…..